Hey guys, its FRIYAY!! Holla fo' yo' dolla, can you feel my excitement?! This outfit is being brought to you by making your clothes go from day to night with a simple switch of your shoes. Okay- so we've all been there- we have a busy day, whether its working then going to an event or running around to different things that fill are social calendars. When I'm out and about, I never want to lug too much around with me. 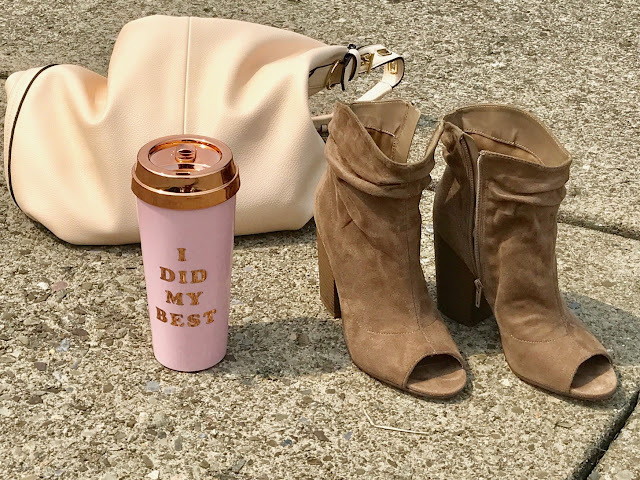 So, If I manage to make my outfit work all day with just the change of shoes or a bag/purse- I'm all about it- and who wouldn't be? These slightly high waisted white shorts are tops! They fit well, wash well and are perfect for taking an outfit from AM to PM. I paired these with a floral t-shirt that keeps it casual if you un-tuck it, and a little more dressy if you tuck it in. Also, I get away with wearing a t-shirt all day because it's not a graphic tee and it has a different texture than a basic cotton t-shirt. Also, the floral pattern keeps it classy for nighttime. I paired my Michael Kors 'Chandler" wedges with this outfit for daytime. They are fun, comfortable, versatile and not too dressy for any occasion. Also, with the colors being white, black & cognac, it covers all the neutrals you'd need to match your outfit to. For nighttime, I changed the look up with these flirty peep toe booties by Steve Madden. They go past the ankle which makes them so chic, and the material is suede, which adds to the luxe feel. These babies are also a neutral shade, making them easy to play matchy-matchy. My marbled earrings are from Francescas, and are an easy way to class up an outfit. 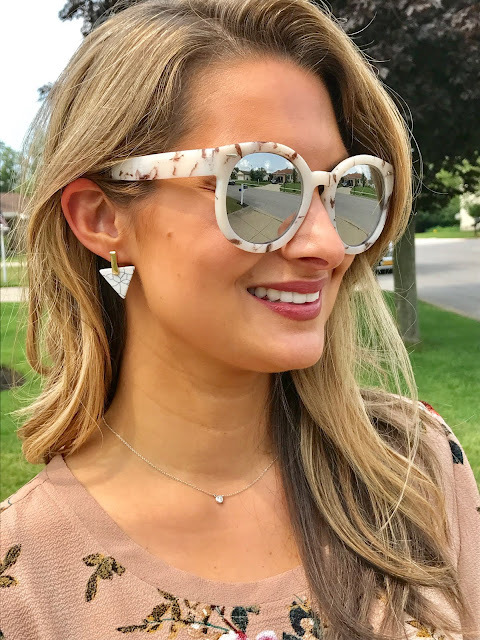 Anytime I can match some accessories, I'll go for it- which is why I'm sporting my Free People shades in almost the identical print as my earrings. It's all about the details, my friends. I paired my whole outfit with a blush colored purse, that works well all day. What is everyone doing this weekend? Let me know!